You're probably familiar with Jimmy Kimmel's "I told my kids I ate their Halloween candy" tradition. Each year Kimmel invites parents to tell their children that they ate all their Halloween candy and to post their reactions on Youtube. Kimmel then features a compilation of many of the videos on his show. Now, by and large, reactions to these videos have been positive. In our culture, this is taken as good comedy and good fun. In fact, it's difficult to find, at least through a Google search, critiques of Kimmel's practice. Consensus, it seems, would be that this practice is basically innocent and ethically sound. However, I think it's important to think critically about what's going on in this practice and in the popular response to it. In the late 19th century and early 20th century, a popular form of entertainment in the United States was what we call "Wild West shows." These Wild West shows were a sort of circus spectacle offering a romantic and exaggerated image of life in the "Old West," featuring equestrian acts, gun slinging and marksmanship performances, and reenactments of famous battles between "cowboys" and "indians" such as the "Battle of Little Big Horn." These reenactments and some of the other performances featured Native American performers. The Native performers were one of the major draws. According to Linda Scarangella McNenly, "Wild West shows consistently produced both romantic and stereotypical representations of Native peoples as exotic noble savages..." White Americans, fascinated with this "savage" culture, attended the performances as a sort of cultural voyeurism, to see and be entertained by the played-up wildness and savagery of the "Indian" other. Native performers who faced constricting and often oppressive conditions on their reservations were, of course, willing to travel with Wild Bill and go on tour with these performances. But, nevertheless, these performances are largely understood today as a form of exploitation. White Americans, up until the 1930's, enjoyed observing the "less developed" and "less rational" native culture as a form of entertainment--"look how they dress! Look at their savagery! Aren't they strange and interesting?" Around the same time in history there were such things as "human zoos" where savage people were literally put on display in exhibits for whites to enjoy. One such exhibit opened in 1906 at the Bronx Zoo. "At first, some people weren’t sure what it was. It — he — seemed much less a monkey than a man, though a very small, dark one with grotesquely pointed teeth. He wore modern clothing but no shoes. He was proficient with bow and arrow, and entertained the crowd by shooting at a target. He displayed skill at weaving with twine, made amusing faces and drank soda" (NYT: "The Scandal at the Zoo"). 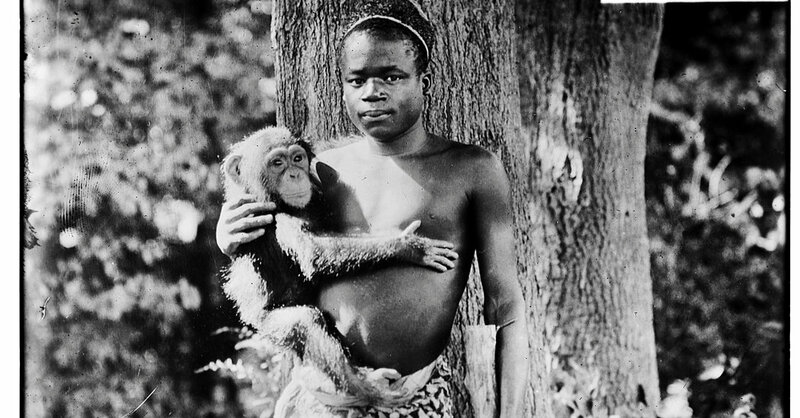 The young man's name was Ota Benga, a Congolese native. In the same day, whites could go see the monkeys, the elephants, and then... oh yes... the "savage." People loved to watch him and laugh at his antics without the slightest thought given to what his account of his own experience, what he felt of his situation. It was just good entertainment. It shouldn't come as a surprise, though, that Ota Benga, at the age of 32, became depressed and shot himself. These spectacles of entertainment--Wild West shows and human zoos, entertainment we'd broadly describe as unethical today--are just examples of the kind of things that emerged during a time in history when the narratives of progress and development were in full swing, when we thought that Western civilization was the civilization and everyone else needed us to help them catch up (unfortunately, the church's history of missionary evangelism was deeply grafted into this narrative). Those who were less developed and less rational, the savages, were entertaining to us. We were fascinated by them and yet we were oblivious to their exploitation and dehumanization because we were blinded by the "innocence" of our fascination. It was good clean fun, good comedy and entertainment. You could say we have come along way. You could say that we're better at seeing the humanity of people who are "other" than us. This is reflected in the fact that the term "savage" is no longer considered ethical academic terminology. To theorize a culture as "savage" would be to succumb to an overt ethnocentrism and to face the ethical charge. But we're not out of the woods yet. What does any of this have to do with Jimmy Kimmel? I'm getting to that. I think we know (or should know) that we're not out of the woods yet in a lot of social locations (take some popular media representations of the Black Lives Matter movement, for example) when it comes to ethnocentrism. It's perhaps more complicated, in some ways, than it was when we were putting human beings in zoos, but I think we know that our biases still tend to lead us to cultural voyeurisms of various sorts. But one place we may be surprised to discover our own ethnocentrism is in the lives of our children. And the Jimmy Kimmel Halloween candy phenomenon is reflective of this. Now before you write me off as a prude--too uptight to appreciate the good clean fun of pranking a 5 year old--consider the possibility that we've made the child out to be a "savage." Where, in our culture, is the narrative of progress and development most uncritically alive today? Where, in our society, is it acceptable to consider someone as less "advanced," less developed, and less rational than we are, on a scale of progress and cultural achievement? Chris Jenks writes, "Just as the early 'evolutionist' anthropologist, self-styled civilized person, simply 'knew' the savage to be different to himself, on a scale of advancement, and thus worthy of study, so we also, as rational adults, recognize the child as different, less developed, and in need of explanation" (Childhood, Second Edition, p. 4). Through naturalist developmental theorization, we have so other-ed the child that it is currently socially acceptable (and remarkably popular!) for us to voyeuristically marvel at their distress as a form of entertainment. What cultural assumptions must exist to create conditions wherein it is not only morally acceptable but entertaining and humorous for us to prank children and watch their response? It is, after all, not the prank itself that entertains us, like pranks we might play on other adults. Telling someone you ate their Halloween candy certainly isn't creative enough for us to consider it as entertainment. It's the reaction that's entertaining; it's the fact that the one being pranked is a child and that, by virtue of their childhood, their reaction is dramatic. The only context where distress becomes entertainment is in what we might call a culture of condescension. The distress of the other, in this case the child, is humorous to us because we consider it to be irrational and therefore illegitimate. This is because we have placed childhood on a scale of advancement on which adulthood is given the highest seat. We consider childhood to be, as Jenks puts it, "...a 'becoming;' tabula rasa; laying down the foundations; inadequacy; inexperience; immaturity; and so on. Such metaphoricity all speaks of an essential and magnetic relation to an unexplicated, but nevertheless firmly established, rational adult world. This adult world is assumed to be not only complete... but also, and perhaps most significantly, desirable" (Jenks, p.8). This is, in perhaps different terms, a classic example of ethnocentrism. When we consider someone to be fundamentally our equal, when we treat them as human beings, their distress (no matter how superficial its' object) becomes not a source of entertainment but a source of empathetic encounter. Sure, some of the children in these videos probably knew they were being silly, so their reaction cannot genuinely be considered distress. But many of the children in the videos were deeply troubled. And it's worth speculating that the source of their distress is not so much the loss of candy but the violation of trust. The one who is supposed to care the most for them has taken advantage of them. So they cry, they yell, they lash out. To this, could we consider laughter to be an empathetic response? I don't think we could if we took seriously the humanity of the child... not just their potential for humanity, but their current status as human beings. In the culture of condescension, the voice of the "savage" is ignored, left unaddressed. We stare at their other-ness but do not consider their own accounting of their situation to be an enlightened or legitimate one. In other words, we do not consider them to be credible sources for the interpretation of their own experience. We think we know better than they do. When you first watched the Jimmy Kimmel video, did you consider whether or not the child at whom you were laughing would give an account of their experience as one worthy of laughter? Did anyone consider interviewing the children to see what they thought of the prank? It'd be absurd to do so, right? But why? Jens Qvortrup rightly asks the question, "Are children a group of people who may legitimately claim to be heard?" (Constructing and Reconstructing Childhood, p.85). The fact that the question could even be considered an interesting one is telling of our position in orientation to children. "All our knowledge on children and childhood seems to remain deeply and unreflectively centered around the experiences of adults..." (p.89). This orientation of adults to children is a direct result of our concept of the child. According to Allison James and Alan Prout, "...there can be no concepts of childhood which are socially and politically innocent" (p.21). We do not consider children's accountings of their own experience because, according to our theory of them, their accounting is subordinate to ours. It doesn't matter if they are distressed (or even traumatized) by an experience if our (adult and therefore rational) accounting of the experience is that it is innocent and funny... it's no big deal, even if the child thinks it is. If the videos featured by Jimmy Kimmel don't bother us, our indifference is exactly what should bother us. And what should bother us more is, perhaps, the cultural consensus surrounding this practice--that it is innocent and funny. What this calls from us is not just a new sensitization toward the distress of children (even over seemingly superficial things like the loss of candy), but a whole new approach to children and a whole new concept of the child--not as "savage" or as potential adult, but as human beings worthy to be listened to and worthy of empathetic encounter. As usual, perceptive and in that empathetic awareness a powerful advocacy emerges. Given that children are full persons and that it can hardly be said that adult persons have a corner on a more progressive personhood, two quick thoughts come to mind. As much as they do not determine value of individuals, do biological differences that are epigenetic not seem to demand a different understanding between children and adults? Is there not some way of describing the differences between people that does not resort to a strict progressive hierarchy? Blair, this is a great question! I do not wish to suggest that there should not be a different understanding between children and adults, indeed there must! There is a difference between the child and the adult and while biology plays its part, I find my resources in anthropology and methods of ethnography for sorting through difference, even differences that emerge through biological contributions. Children are not aliens but nor are they just (less sophisticated) versions of ourselves (to channel Clifford Geertz). I would want to be critical of any approach (like perhaps Robert Epstein's) that wants to conflate childhood (and youth) and adulthood. The difference is important and I would go further to say that it not only demands different understanding but different responsibilities from children and adults--responsibilities for each other. The difference is ethically symmetrical, rejecting a strict progressive hierarchy, but different nonetheless. Adults have specific responsibilities toward children that cannot be ignored (though it is not simply a responsibility of assimilation). This is extremely important when we're considering vulnerability and public policy. There's certainly more to be said, but this is where I'd start. Recently, I am finding great resources in disability studies (especially the work of John Swinton) for sorting through the question of difference, but two resources that have been most helpful in this are Erin Raffety's short article "Minimizing social distance" and especially John Wall's work in Christian ethics (particularly his book 'Ethics in Light of Childhood' and his wonderful article, "Childhood Studies, Hermeneutics, and Theological Ethics"). Thanks for the question, Blair! Thanks for the tip towards those resources. As my long delay in answering should imply, life is full at my end. The binary child-adult isn't so simple when we introduce various distinct age groupings; newborn-toddler-tween-teen-young adult-geriatric adult etc. Symmetry and models based on it work well in binaries but get messed up, I think, in more complex systems. Not to accuse you of dumbing something down but to say that the category "child" and the category "adult" need further definition and in that might take on meanings that do not lead to neat symmetry. Keep at it Wes. I appreciate your thoughts and promptings.